Announced earlier this year, the Olympus VG-130 is an affordable ultra-compact digital camera featuring a 14-megapixel sensor, a 5x wide zoom lens, a set of "Magic Filters", a handy panorama assist mode and a metal body. Other highlights include a 3-inch LCD screen and a dedicated Movie Record button that enables one-touch video recording in HD quality. Available for £99.99 / $139.99, the Olympus VG-130 comes in a choice of silver, black, red and pink. 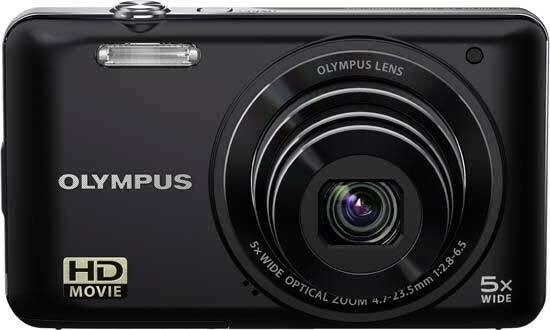 The Olympus VG-130 is a neat little digicam that's about the same size as a typical smartphone. Surprisingly for a camera of this class, the outer shell is made of metal, which lends an air of sophistication to what is essentially an entry-level product offered at an entry-level price. The design of the camera is simple, almost minimalistic. The lens, which sits fully retracted into the body when the camera is not in use, occupies almost the entire right half of the face plate. Spanning a 35mm equivalent focal range of 26-130mm, it goes wider than most compact camera lenses, which again is a nice touch at this price point. Its maximum aperture is a fast f/2.8 at the wide end but a disappointingly slow f/6.5 at full telephoto. The rest of the front plate features two pinpricks indicating a built-in microphone bottom left of the lens surround, a sliver of a window for the on-board flash and AF assist lamp. The top panel offers even less in the way of controls, featuring only a small on/off button and a well-placed and adequately sized shutter release. The back of the camera is dominated by the three-inch rear screen, whose resolution of 230,400 dots is a bit on the low side for a display of this size. To the right of this monitor, we find a cluster of controls that include a pair of zoom rockers, a red Movie Record button that enables you to start capturing a video clip anytime you see something worth being filmed, a Playback button that can be configured to act as a secondary power button when all you want to do is review the pics and videos stored on the memory card, a standard four-way navigation pad, plus a Menu and a Camera Guide button. Notable by absence is an exposure compensation button and a direct-access button to ISO sensitivity settings. Both of these important functions are buried in the menu, as is the AF mode, self-timer, macro and flash mode and white balance - all of which tend to be mapped onto the four-way pad on most other compact cameras. Thus, the operation of the Olympus VG-130 is almost entirely menu driven. The camera has two main menus, a Function Menu and a Setup Menu. The former is accessible by pressing the Left arrow button. The top menu item is always the shooting mode, with the options being Program Auto, Scene, iAuto, Digital Image Stabilisation, Magic Filter and Panorama. The other menu items available depend on the shooting mode chosen, and may include the flash mode, macro, self-timer, exposure compensation, white balance, ISO sensitivity, and drive mode. The AF mode cannot be set from the Function Menu; you have to enter the Setup Menu for that. The full set of functions listed above is available in P (Program Auto) mode only. As there is no Aperture Priority, Shutter Priority or Manual mode on offer, you never get to set the aperture or shutter speed yourself. As far as scene modes go, there 14 in total, including Portrait, Landscape, Night Scene, Night Portrait, Sport, Beach & Snow, Indoor, Candle, Pet, Self-portrait, Sunset, Fireworks, Cuisine, and Documents. In iAuto mode, the camera analyses the scene in front of its lens and chooses what it thinks is the best scene mode at its own discretion. In Digital Image Stabilisation (DIS) mode, the camera appears to do nothing special apart from picking a high ISO speed in an attempt to avoid motion blur resulting from shaky hands in low-light situations. Crucially, there is no optical or mechanical image stabilisation on board. "Magic" is probably the most interesting shooting mode offered by the Olympus VG-130. In this mode, you get to choose from seven different "magic filters". These include Pop Art, Pinhole, Fish Eye, Drawing, Soft Focus, "Punk" and "Sparkle". In the Image Quality section of this review, you can see the effect of each filter. The Panorama mode is essentially a stitch assist function - unlike the manufacturer's more advanced compacts, the Olympus VG-130 does not offer automatic in-camera stitching. After you've selected the pan direction and taken the first shot, the camera shows a part of the just-captured frame on the side of the display opposite the pan direction, allowing you to line up the next one with a healthy amount of overlap for stitching later on the PC using the supplied software. You can capture up to ten frames for a panoramic image. 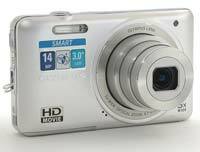 As mentioned above, you need not enter a special movie mode to shoot video clips with the Olympus VG-130. Courtesy of the red Movie Record button, you can start filming whenever you want, as long as the camera is turned on, of course. The VG-130 can capture movies at a resolution of 1280x720 (HD), 640x480 (VGA) or 320x240 pixels (QVGA). The optical zoom can be used while filming, but you have to turn off audio recording first. If you want to record video with sound, you can only use the digital zoom. Videos are compressed using the Motion JPEG codec and stored in an AVI container. The maximum file size of a single movie is 2 Gigabytes, regardless of the capacity of the memory card. Once you have captured a photo or a video clip, the Olympus VG-130 has a limited range of options when it comes to playing, reviewing and managing your files. You can instantly scroll through the images that you have taken, view thumbnails (up to 30 onscreen at the same time), zoom in for close inspection at up to 10x magnification, view a slideshow, rotate, crop, protect and erase an image, and change the image information display. You can also add a voice memo to any image, and apply some post-capture redeye reduction and lighting fix. The Olympus VG-130 is powered by a replaceable, proprietary LI-70B lithium-ion battery, which can be charged in-camera via USB and the supplied USB-AC adapter that plugs into the wall. Charging usually takes approximately 3 hours. The battery shares its compartment with the memory card (the camera takes SD and SDHC cards but isn't compliant with the SDXC standard). Battery and card are both protected by safety latches, so they won't fall out accidentally if you open the compartment door. The latter is placed as far away from the tripod socket as possible, so it may be possible to change batteries and cards while the camera is on a tripod, but this will depend on the size of the quick-release plate you use (if you use any). In use, we have found the Olympus VG-130 to be a moderately responsive camera - start-up and zooming is fast enough for most uses, but the autofocus is generally too slow for most things that move. It's perfectly OK for stationary subjects though, and the focus assist lamp helps the camera lock focus even in low-light conditions. As mentioned earlier, we weren't fond of the menu-based approach, wishing that at least a few functions - like exposure compensation and ISO sensitivity settings - were available at a press of a dedicated button, even if it was simply one of the navigation buttons. This concludes our evaluation of the handling and features Olympus VG-130. Let us now move on to the image quality assessment.